Shot on location in New Mexico and featuring a cast of relatively unknown actors, British director Gareth Edwards has made a low-budget (reportedly as little as £500,000), mini-masterpiece in Monsters (2010), a mesh of industry-standard effects and raw human emotions, featuring two protagonists you can really connect with – a rarity in the science fiction genre, one could argue. The plot centres on pessimistic journalist Andrew Kaulder (Scoot McNairy) who agrees to accompany American tourist Samantha (Whitney Able) to the safety of the US border, where she will be reunited with her domineering father. What makes this task challenging is the hazardous “infected zone” they must travel through, spanning a large part of the Mexican interior, and unfortunately occupied by gigantic, hostile extraterrestrials. 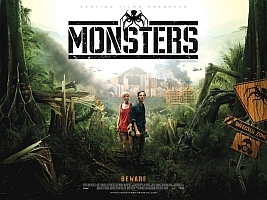 Monsters’ strengths lie in its simplicities; the aliens are rarely seen and the action is sporadic, which is admittedly frustrating yet effective in equal measure. Overuse of CGI effects could have potentially rendered the film as a bog standard “B movie” spectacle. Thankfully, Monsters gives its other-worldly creatures just the right amount of exposure to keep the audience on the edge of their seats throughout its slender 90 minute runtime. Beautifully shot and capably handled, Edwards’ cinematic directorial debut is a heartfelt and touching exploration of two well-drawn, troubled characters, which just happens to feature extraterrestrials as a backdrop to the central narrative. With rickety, hand-held camerawork that rivals (but never copies) Matt Reeves’ gimmicky Cloverfield (2008) and a narrative that combines the best elements from many “alien-centric” efforts, notably last year’s hugely enjoyable District 9 (2009), Monsters excels in keeping the audience’s attentions close, and their anticipations even closer.